Can you identify any of the people in this photograph? 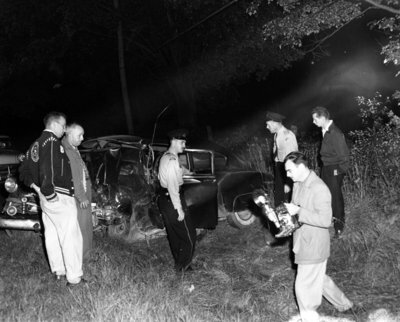 A black and white large format negative of a car accident. People can be seen looking at the car. This negative was part of a collection of negatives found in the Archives storage room. Actual date of negative and photographer are unknown. Car Accident, c.1950, Photographer Unknown. Whitby Archives A2013_034_003.